Slice the onions into thick rings and push from the middle to separate the rings individually. In a bowl place flour mustard powder and seasoning. Place crumbs in a separate bowl. In another bowl add egg, Dijon mustard, minced garlic and beer. Whisk together well. Place onion rings into the flour mix, coat well and then remove and set aside. Keep mix. Slowly add the remaining flour mix to the egg mix and whisk until all combined to make the batter. Put onion rings into batter mix and completely coat, remove and lay on wire rack with foil/paper underneath to drain excess batter. Place rings, a couple at a time into the crumbs, ensuring they are well coated. Place on tray and refrigerate for at least 10mins before frying. Heat oil in pan until hot. Place rings, in small batches, carefully into oil and shallow fry until golden brown, approx. 3 mins, turning half way. 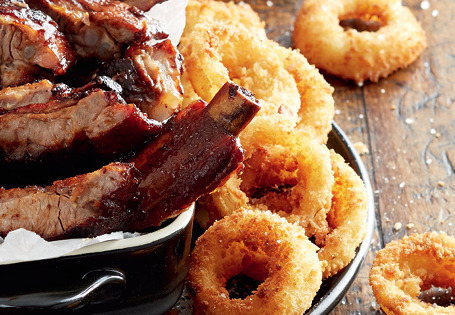 TRY our delicious Honey Garlic Pork Ribs with our Onion Rings. See recipe here.